Built to order, high quality custom power supply cables for your boutique or vintage amplifier. Constructed from 14 AWG stranded copper wire with silver soldered ends and custom plugs. Exterior shielding consists of stainless steel braiding, wrapping a 20 mil rubber inner core. Cables are able to withstand hundreds of pounds of pressure (i.e. dollies & casters) being rolled over them onstage and the rigors of touring road use. Margasa’s higher quality cables provide a more consistent power signal which makes for a cleaner current and a quieter amp. Built to the same specs as Rosebraid except housed in high quality industrial electrical conduit shielding. All Margasa speakers are custom built and can be constructed in either a 1x12, 2x12, or 4x12 configuration. Margasa Amp Co. is an OEM for Jensen Speakers and believes in Installing only the highest quality units by the Italian company, After all, the best sounding amplifier is only as good as the final tone it produces through an outstanding set of speakers. 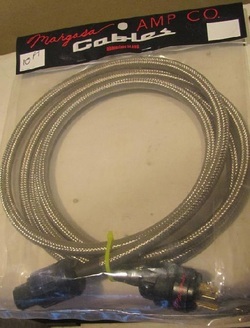 All Margasa Cabinets are custom wired with the same silver wire Teflon coated used in the amps as well as fitted with Switchcraft input/output jacks. The cabinets are the highest grade solid 1” Brazilian White Pine. Speaker choices include JET, MOD, Vintage, and NEO series available in 10”-12” and 35 - 100 watts. When seeking a high quality, unsurpassed cabinet to go along with any amplifier, custom or standard, Margasa can produce a speaker to match all of your professional needs.